How to draw hand. In this tutorial you will learn how to draw hands in different poses. It can be used for both men and woman. You just have to refine them a bit more to your specific need. The step by step tutorial is below if you scroll further. This is a simple drawing that will be perfect for any aspire artists who are doing manga, comics and anime. Drawing demonstration for cartoon, illustration, comics, anime, manga online lesson. Hand is an important element of expression when you are illustrate a figure. Also hand gesture is one of the most important form of non-verbal communication in which visible bodily actions communicate particular messages. It can either in place of speech or together and in parallel with spoken words. Gestures include movement of the hands, face, or other parts of the body. I know drawing hands can be intimidating, but as artists or illustrators you can not avoid doing them. But this tutorial will give you easy to follow instruction and you will end up thinking that it is a lot easier than you ever thought before. Let’s begin. This is a very basic drawing and sketching tutorial of how to construct a hand, nothing fancy. How to draw hand step by step down below. But in this tutorial, in my opinion, you don’t have to draw every single detail of the hand because as a concept artist or illustrator, you will hardly ever just draw and paint hand by itself. 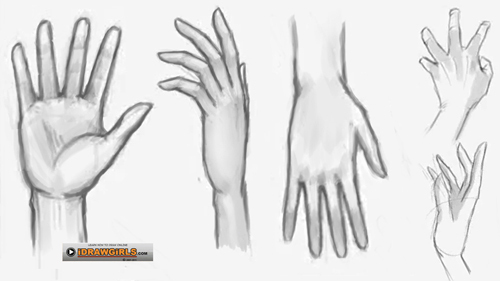 So this tutorial will demonstrate the basic structure and simplified hand drawing. More detail, doesn’t necessary means better. The accurate depiction, proportion, and expression without over doing it, to me, is more important than putting a bunch of wrinkles, bumps, etc. Get the hand shape and proportion correct with the minimal use of lines, then you can go ahead and add detail as you please, with thinner line detail. neat!~ that’s so helpful ! Fantastic tutorial. Still the hardest thing in the world for me to draw. These tips should help a lot. Thanks! !